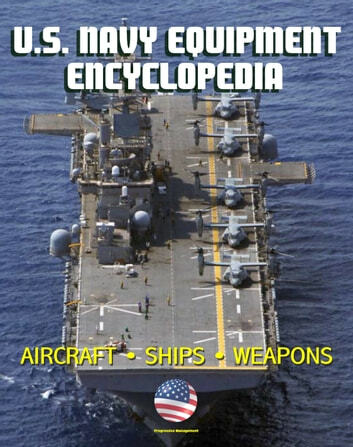 Hundreds of U.S. Navy systems - from patrol craft to nuclear submarines - are comprehensively described in this detailed, up-to-date encyclopedia of naval equipment. 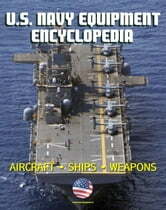 This massive 500-page report also includes the latest Navy Program Guide document, providing an overview of key systems, programs, and initiatives of the Navy. Here are some of the systems covered (space limitations prevent a complete listing): Aircraft, Fixed Wing - C-2A Greyhound logistics aircraft, C-9 Skytrain logistics aircraft, C-12 Huron logistics aircraft, C-20 Gulfstream logistics aircraft, C-26, C-37A (Gulfstream V) and C-37B (Gulfstream 550), C-130 Hercules logistics aircraft, C-40A Clipper logistics aircraft, E-2 Hawkeye early warning and control aircraft, E-6B Mercury airborne command post, EA-6B Prowler electronic warfare aircraft, EP-3E (ARIES II) signals intelligence reconnaissance aircraft, F-5N/F Adversary aircraft, F-14 Tomcat fighter, F-16A/B Fighting Falcon Fighter, F/A-18 Hornet strike fighter, Learjet 35/36, NU-1B Otter light cargo transport, P-8A Multi-mission Maritime Aircraft (MMA), P-3C Orion long range, ASW aircraft, S-3B Viking detection and attack of submarines aircraft, T-2C Buckeye jet trainer, T-6A Texan II turboprop trainer, T-34C Turbomentor training aircraft, T-38 Talon supersonic trainer, T-39D radar-navigational trainer, T-39N/G Sabreliner training aircraft, T-45A Goshawk training aircraft, U-6A Beaver all-purpose utility transport, RQ-2A Pioneer Unmanned Aerial Vehicle (UAV), RQ-8A and MQ-8B Fire Scout Unmanned Aerial Vehicle (UAV), X-26A high performance glider, Aircraft, Rotary Wing - HH/UH-1N Iroquois helicopter, CH-53D Sea Stallion helicopter, H-3 Sea King helicopter, MH-53E Sea Dragon helicopter, SH-60 Seahawk helicopter, TH-57 Sea Ranger helicopter, TH-6B helicopter, VH-3D Sea King helicopter, V-22A Osprey tilt rotor aircraft, VH-60N Night Hawk helicopter, Anti-Submarine Warfare (ASW) Training Targets, MK 30 Mod 1 ASW Target, MK 30 Mod 2 ASW Target, MK 39 Expendable Mobile Anti-submarine warfare Training Target (EMATT), Guns, Weapon Systems, MK 45, 54-caliber lightweight gun, Aegis System, AGM-154 Joint Standoff Weapon (JSOW), Joint Direct Attack Munition (JDAM), MK 38 - 25 mm machine gun system, MK 46 - 30mm Gun Weapon System, MK 41 VLS, MK 45 - 5-inch-gun 54/62 Caliber Guns, MK 75 - 76mm/62 caliber 3, U.S. Navy Mines, MK 15 Phalanx Close-In Weapons System (CIWS), SeaRAM Close-In Weapon System (CIWS), Anti-Ship Missile Defense System, Shipboard Protection System (SPS), AN/SQQ-89(V) Undersea Warfare / Anti-Submarine Warfare Combat System, Torpedo - MK 46, Heavyweight Torpedo - MK 48, Torpedo - MK 50, Torpedo - MK 54, Missiles - AIM-120 Advanced Medium-Range, Air-to-Air Missile (AMRAAM), Harpoon Missile, AGM-88 HARM Missile, AGM-114B/K/M Hellfire Missile, AGM-65 Maverick Guided Missile, Penguin Anti-Ship Missile, AIM-54 Phoenix Missile, RIM-116 Rolling Airframe Missile (RAM), Sea Sparrow Missile (RIM-7), Evolved Sea Sparrow Missile (ESSM) (RIM 162D), AIM-9 Sidewinder Missile, SLAM-ER Missile, Standard Missile, Tomahawk Cruise Missile, Trident Fleet Ballistic Missile, Vertical Launch Anti-Submarine Rocket ASROC, (VLA) Missile, Submarines - Attack Submarines SSN, Fleet Ballistic Missile Submarines SSBN, Guided Missile Submarines SSGN, Deep Submergence Rescue Vehicle DSRV, Large Scale Vehicle LSV 2, Surface Ships - Aircraft Carriers CVN, Amphibious Assault Ships LHA/LHD/LHA(R), Amphibious Command Ships LCC, Amphibious Transport Dock LPD, Cruisers CG, Destroyers DDG, Dock Landing Ship LSD, Fast Sea Frame FSF, Frigates FFG, Joint High Speed Vessel JHSV, Landing Craft, Air Cushioned LCAC, Landing Craft, Mechanized and Utility LCM/LCU, Littoral Combat Ships LCS, Mark V Special Operations Craft, Mine Countermeasures Ships MCM, Patrol Coastal Ships PC, Rigid Hull Inflatable Boats RHIB, Submarine Tenders AS, Yard Patrol Craft YP, Underwater Search and Recovery Equipment CURV 21, much more. F4U Corsair vs Ki-84 "Frank†?